Today I am going to share with you how to Add face book likes or face book fan page widget on blogger blog or website. It a simple way. just do the following step as below. It is very nice toll for increase your fan page like through blog or website. It also increase the beauty of our blog or site. so add today. Follow the instruction as face book developer page. if you unable to do then see the following step. 1. Go to this URL. 2.Enter your fan page URL in URL to Comment on Box. 3. Decide your width and height of width as you wish to add on you blog/ blogger website. 4. Now Click on Get Code Button. 5. Now a pup up windows will open. 7. Now Copy this Code. 11. Give Name - Like me On Facebook. 12. Enter your Copy Code in box. Now : You will get your fan page like box on Blog. See also: Add Twitter Flying Bird on blogger / website. 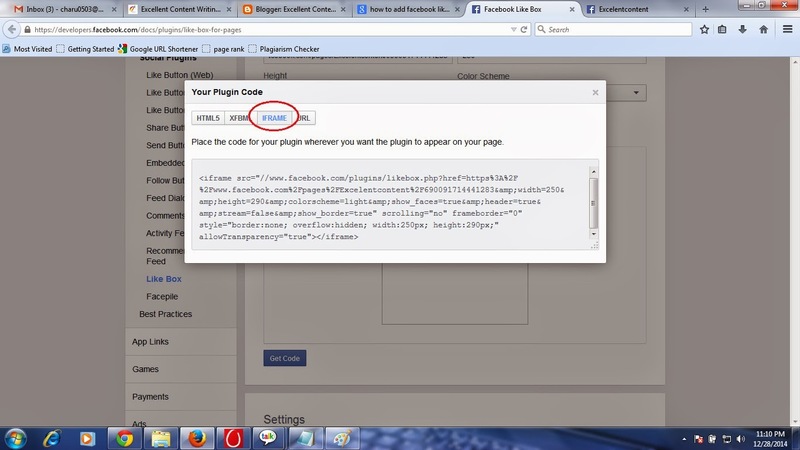 Labels: How to Add Facebook likes Widget on Blogger?